Gastrointestinal tract (GIT) is not among the objects is well visible on x-ray. Radiography of the abdomen without contrast only shows the spine, pelvis, lower ribs. Against this background, in normal you can see the gas bubble of the stomach. To assess the state of the digestive organs on the x-ray, can not do without contrasting. 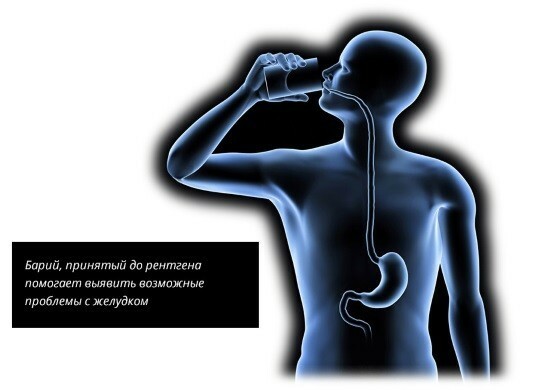 Therefore, radiography of the stomach, as a stage in the study of the upper gastrointestinal tract, is performed after filling said body with barium sulfate. This study helps to see the signs of a variety of pathological processes: ulcers, polyps, tumors, gastritis. X-ray shows the functional state of a body allows to assess the activity of peristalsis, the rate of excretion of contrast. Looking at the picture, judge the location and shape of the stomach. Rapid loss of body mass (suspected cancer). Difficulty swallowing, pain when swallowing. 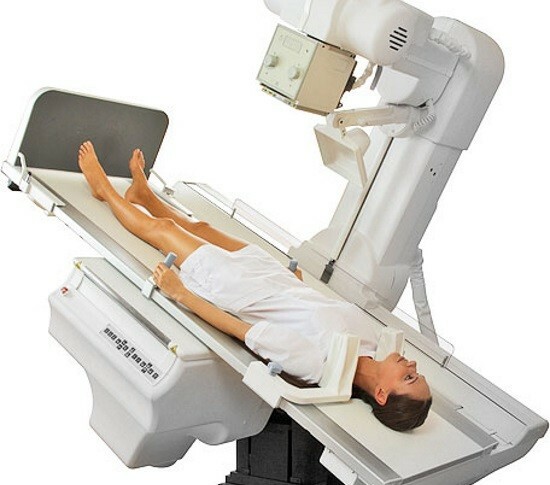 X-rays of the stomach, thus, is applied by reducing the speed of evacuation of food (for example, on the background of pyloric stenosis), the presence of foreign bodies, suspected cancer, peptic ulcer, hernia hiatal, inflammation (gastritis). Pregnancy. The study can be conducted only for health reasons! The serious condition of the patient. A diagnostic procedure is performed for a long time, requires a change in body position that may be difficult for debilitated patients, patients after trauma. The contrast cannot be used in certain acute surgical diseases. Suspected ongoing bleeding or gastric ulcer perforation is a contraindication to ingestion of barium. In case of perforation can be done only panoramic image without the use of contrast to identify gas in the abdominal cavity. In the picture it will be visible as a Crescent, the site of enlightenment under the right dome of the diaphragm. Children’s age is not a contraindication. However, it should be remembered that the preparation of these patients, the recommended amount of the contrast agent, the position, where do the pictures have their own characteristics. 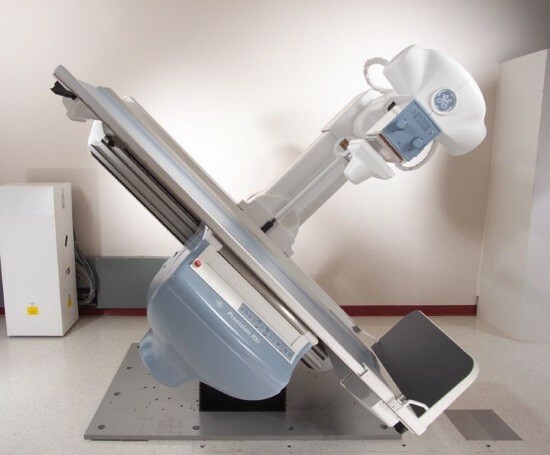 The radiation dose during x-ray examination of organs of the upper digestive tract (particularly the stomach) is 0.1 to 0.8 mSv in digital and film radiography respectively, 3.5 mSv fluoroscopy. 8 hours before the study to stop taking food and liquids. If an x-ray of a child, the time parameter is changed. A period of starvation for a baby under one year is limited to 4 hours, for a child over the year – 6 hours. 2-3 days before the procedure to avoid eating foods that help you poop: baking, carbonated beverages, cabbage, dairy products, beans, peas, beans, apples. Flatulence can be a serious obstacle for obtaining high-quality image. gastric lavage if the patient has hampered the evacuation of food from the pyloric division. Often together with examine the stomach and esophagus. So first the patient takes a few SIPS of the contrast agent, and then the picture. It is estimated by the roughness of the walls of the esophagus. Next, for filling the stomach, the patient drinks the remaining contrast. As the drug, visualizing the digestive tract on x-ray, usually using a barium sulfate. It is an inert substance, insoluble in water, non-toxic to humans. The drug does not penetrate into the bloodstream and excreted in faeces. Possible unwanted effects of allergies. Barium also has a pinning effect and can cause constipation. there is the likelihood of contrast in the peritoneal cavity (suspected perforated ulcer). X-ray examination of the stomach is not an indication for hospitalization. It can be done on an outpatient basis. The main thing is to prepare for the exam. Right front oblique. In this position, clearly visible pyloric Department and the duodenum. The body of the patient facing the cassette at an angle of 40-70°. Left arm bent at the elbow and raised to the head, right down. Front right half of the body is pressed to the cassette. Front. This position displaces the body and pyloric part of the stomach. The patient lies on the stomach or facing the cassette, arms bent at the elbow and raised to the head. The right-hand side. This packing do if abnormal formations localized mainly on the rear wall of the stomach. The patient lies on his right side or is turned right-side to the cassette. Arms bent at elbow and raised to the head. Left rear oblique. This provision applies for double contrast pyloric and duodenal bulb. The left rear part of the body adjacent to the cassette body turned to the latter at an angle of 30-60°. Hands raised to head. Back. Used for taking a picture in the Trendelenburg position. In a classic laying back the patient lies on his back, arms stretched along the body. In the Trendelenburg position foot-end lift at an angle of 45°. The pelvis of the patient is above his head. X-ray in Trendelenburg do if you suspect a hernia hiatal. In this position the abdominal organs are displaced upward. If the esophageal opening expanded part of the stomach may pass through it and be in the cavity of the chest. The study was conducted in the horizontal and vertical position. In the latter case, it is possible to estimate the shape of the stomach and its compliance with the Constitution of the patient. In the examination of young children snapshots are performed primarily in a horizontal position. 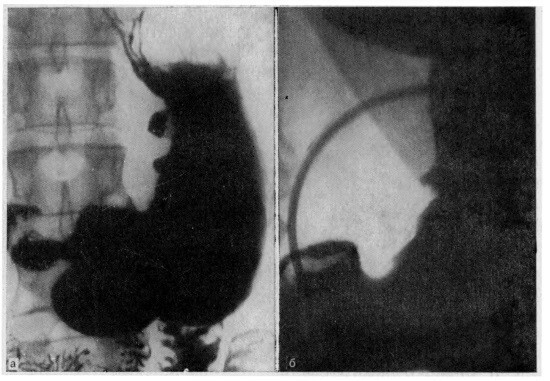 X-ray examination of the stomach – long process, during which the distribution of the contrast observed in real time, and make sighting shots at the positions as clearly visualize the pathology. In standing position the stomach has the shape of a hook. The contrast fills it evenly, allowing to consider all the anatomical divisions of the body. Wall smooth. The serration contour can be observed at the greater curvature in the body and pyloric due to the folding of the mucosa. Normostenikov the body of the stomach is parallel to the spine, the gatekeeper is determined by level I-III lumbar vertebrae. Astenikov stomach extended, lies to the left of the vertebral column. The gatekeeper is located to the left of the median line, or directly in its projection. The lower pole of the stomach descends to the V lumbar and I-II sacral vertebrae. 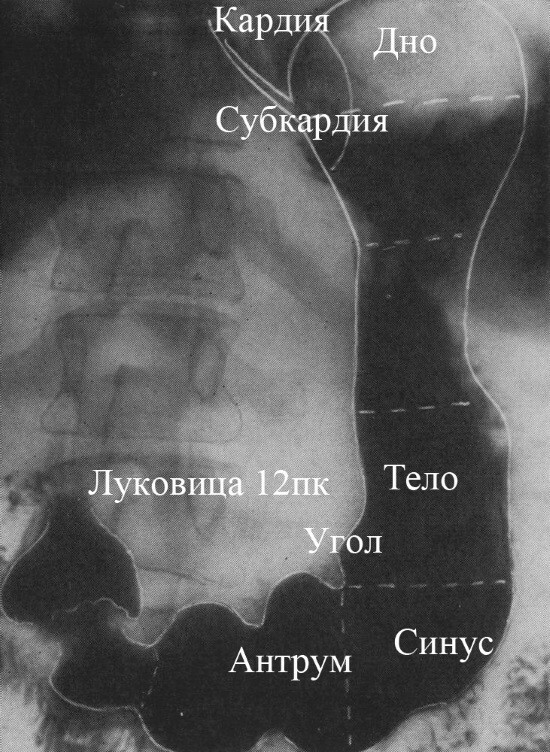 Giperstenikov there is no clear transition between the body and the pyloric part. The stomach is transversely or obliquely. The pylorus lies to the right of the spine at the level of XII thoracal and I lumbar vertebra. The discrepancy of the forms investigated on the type of Constitution can point to functional disorders or organic pathology. Persistent displacement of the stomach indicates the commissural process, the violation of a provision of the adjacent organs, the emergence of abdominal mass lesions. Gastritis. In hypertrophic variant of the disease is observed thickening and over-expression of the folds, in atrophic — their smoothness. Often disturbed functional activity of the organ under investigation. Atony of the stomach. Barium accumulates in the lower divisions. The stomach is lengthened, the gas bubble is elongated, peristalsis weakened, the gatekeeper gapes. Toning. Barium is retained in the upper sections of the gas bubble is short and broad, the peristalsis is strengthened. Ulcer. In the picture you can see the characteristic symptom of the niche. Contrast bleeding outside the contour of the stomach. Neoplasms: polyps, cancer. The x-rays converted in the lumen of the stomach tumors appear as filling defects, i.e., those parts not filled with contrast. The malignant process may be suspected by an uneven contour. With the growth of the tumor in the stomach wall observed its deformation and narrowing of the lumen. Diverticulum (bulging wall). As with peptic ulcer disease, is characterized by the symptom of the niche. The difference is the presence of a thin neck that connects the recess to the contour of the stomach. Anomalies: pyloric stenosis, shortening of the esophagus with the localization of the stomach in the chest, and others. Do an x-ray and to assess the rate of gastric emptying. Normally, the barium moves completely into the intestine after 1.5-3 hours. If the contrast is mixed with food, emptying time of the stomach increases. Radiography allows not only to detect pathological formation in the stomach cavity, but also to appreciate its form, position, functionality. 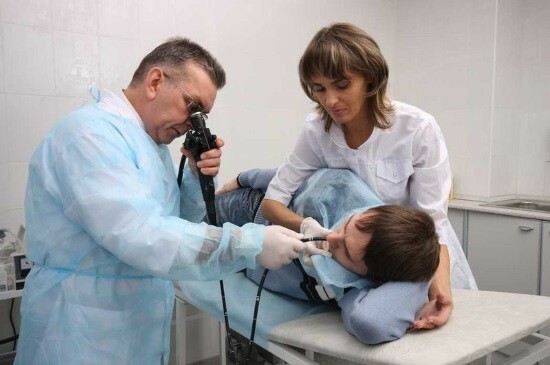 Endoscopy (EGD) is the main method of detecting pathology of the stomach. Preparations similar to that before the x-ray with contrast. EGD allows you to inspect the lining of the stomach, if there are any entities to take material for biopsy, and even perform therapeutic manipulation (stopping the bleeding from erosions or ulcers). The study is not connected with the radiation, is fast, allows you to see firsthand the pathology. However, as x-ray, EGD does not allow to consider the stomach wall, its thickness, structure, presence of tumors. The procedure is valued by patients as unpleasant. Young children to perform EGD is extremely difficult. Moreover, endoscopic examination it is impossible to evaluate the shape of the organ, its localization and functionality. KT informative is superior to an x-ray of stomach with barium. The study allows us to see not only the stomach, but its walls, and the adjacent education: adjacent organs, lymph nodes. The latter is important to determine the extent of spread of a malignant tumor. 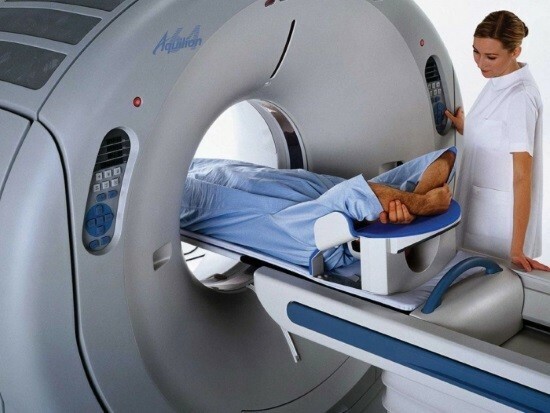 However, as x-ray, CT involves patient exposure and failed to address intragastric pathology as thoroughly as EGD.